NAIROBI, Apr 25 2015 (IPS) - Armed with twigs and placards, enraged residents from a semi-pastoral community 360 km north of Kenya’s capital, Nairobi, protested this week against wanton destruction of indigenous forest – their alternative source of livelihood. With climate change a new ordeal that has caused frequent droughts, leading to suffering and death in this part of Africa, the community from Lpartuk Ranch in Samburu County relies on livestock which is sometimes wiped out by severe drought leaving them with no other option other than the harvesting of wild products and honey. “People here are ready to take up spears and machetes to guard the forest. They have been provoked by outsiders who are out to wipe out our indigenous forest to the last bit,” Mark Loloolki, Lpartuk Ranch chairman, who led the protesting community members told IPS. They threatened to set alight any vehicle caught ferrying the timbers or logs suspected to be from their forests. Their protest came barely a week after counterparts from Seketet, a few kilometres away in Samburu Central, held a similar protest after over 12,000 red cedar posts were caught on transit to Maralal, Samburu’s main town. Last year, students walked for four kilometres during International Ozone Day to protest against the wanton destruction of the same endangered forest tree species. A report titled Green Carbon, Black Trade, released by the U.N. Environment Programme (UNEP) and Interpol in 2012, which focuses on illegal logging and its impacts on the lives and livelihoods of often some of the poorest people in the world, underlines how criminals are combining old-fashioned methods such as bribes with high-tech methods such as computer hacking of government websites to obtain transportation and other permits. Samburu County, in Kenya’s semi-arid northern region, hosts Lerroghi, a 92,000 hectare forest reserve that is home to different indigenous plants and animal species. Lerroghi, also called Kirisia locally, is among the largest forest ecosystem in dry northern Kenya and was initially filled with olive and red cedar trees. It is alleged that unscrupulous merchants smuggle the endangered red cedar products to the coastal port of Mombasa for shipping to Saudi Arabia where they are sold at high prices. “This is a business that involves a well-connected cartel of merchants operating in Nairobi and Mombasa,” said Loloolki. 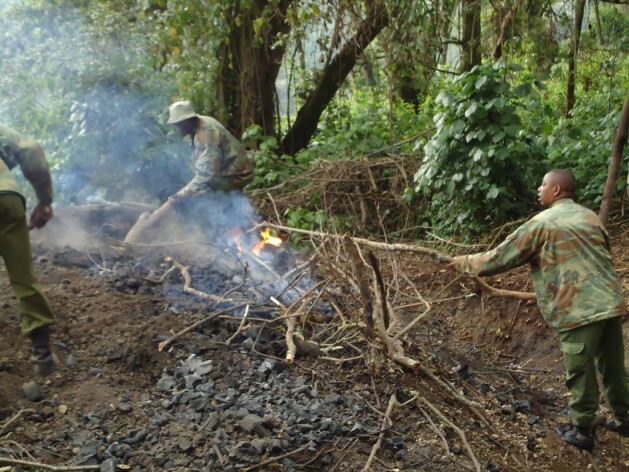 In Kenya, the future of indigenous forest cover is under threat but has little to do with poverty and ignorance – experts say that it is greed which allows unsustainable practices, such as the lucrative production of charcoal and logging of wood. At the same time, Chemitei told IPS that squatters currently residing inside the forest are mainly families affected by insecurity related to cattle rustling, adding that their presence was posing a threat to the main water towers of Lerroghi, Mathew Ranges, and Ndoto and Nyiro mountains. He further noted that harvesting of cedar regardless of whether forest was privately or publicly owned was banned in 1999, and that over 30,000 hectares – one-third of the Lerroghi forest – has been destroyed. Reports from INTERPOL and the World Bank in 2009 and from UNEP in 2011 indicate that the trade in illegally harvested timber is highly lucrative for criminal elements and has been estimated at 11 billion dollars – comparable with the production value of drugs which is estimated at around 13 billion dollars. According to the KFS Strategic Plan (2009/2010-2013/2014), of the 3.4 million hectares (5.9 percent) of forest cover out of the Kenya’s total land area, 1.4 million are made up of indigenous closed canopy forests, mangroves and plantations, on both public and private lands. The plan also indicated that Kenya’s annual domestic demand for wood is 37 million cubic metres while sustainable wood supply is only around 30 million cubic metres, thus creating a deficit of seven million cubic metres which, according to analysts, means that any projected increase in forest cover can only be realised after this huge internal demand is met. Last year, Kenya’s Cabinet Secretary for Environment Judi Wakhungu said that KFS’ revised policy framework for forest conservation and sustainable management lists features including community participation, community forest associations and benefit sharing. The policy acknowledges that indigenous trees or forests are ecosystems that provide important economic, environmental, recreational, scientific, social, cultural and spiritual benefits. Nevertheless, illegal harvesting of forest products is pervasive and often involves unsustainable forest practices which cause serious damage to forests, the people who depend on them and the economies of producer countries. Forests have been subjected to land use changes such as conversion to farmland or urban settlements, thus reducing their ability to supply forest products and serve as water catchments, biodiversity conservation reservoirs and wildlife habitats.